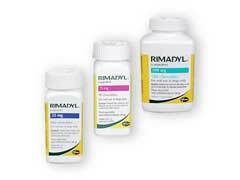 Rimadyl for dogs is commonly prescribed by vets to prevent and treat joint pain and arthritis in canines. It is easy to administer the medication because Rimadyl can be given one time each day, or you can divide the dose in half and give a half dose every twelve hours. The generic name for this medication is Carprofen for dogs, and this drug should never be given to cats. If your pet has been prescribed Rimadyl for dogs make sure to give with food to prevent any stomach upset, and always make sure that your pet has plenty of fresh water available at all times. If your vet prescribes this medication then you need to be aware of all the possible Rimadyl side effects, because a number of these can be serious or even life threatening with dogs. If your pet vomits blood, or has black stools which are tarry, then internal bleeding may be a complication and this should be evaluated immediately by an emergency vet facility. Rimadyl for dogs is safe for most pets, but the drug may interact with certain other medications including over the counter remedies. You should never give your dog OTC treatments without checking with your vet first. A Rimadyl overdose can occur, and if this happens you should take your pet to the nearest animal ER right away. The Rimadyl dosage will be determined by your vet, and this is typically two milligrams of the drug for every pound of body weight if given once a day, or half of this amount given two times per day. Rimadyl for dogs does have some dangers, but for some pets with arthritis or other joint problems the drug can be highly effective when used as directed. The possible side effects of this NSAID, some of which are dangerous, have caused a number of vets and pet owners to choose Rimadyl alternatives instead.